University of Alaska Press, 9781602231009, 215pp. For most of us, the Arctic conjures up images of freezing and forsaken solitude. Hence, Austrian painter Christiane Ritter was at best ambivalent when her husband asked her to join him on the small Arctic island of Spitsbergen in a tarpaulin-covered hut sixty miles from the nearest neighbor. Yet his descriptions were filled not with cold and hardship but tales of remarkable wildlife, alluring light shows, and treks over water and ice. Won over, Ritter joined her husband and grew to love life on this small isle off Norway's coast, and in this charming memoir she describes her experiences, with insight and wry humor. 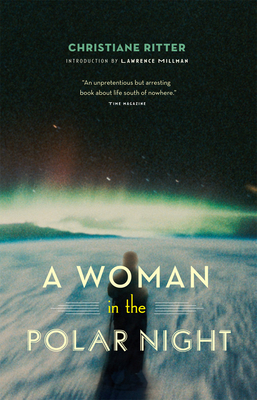 Whether or not you ever plan a trip to the Arctic, A Woman in the Polar Night offers thoughtful reflections on isolation and the place the natural world holds in the human psyche. Christiane Ritter was an Austrian painter. She wrote A Woman in the Polar Night after her return to Austria in 1934 and the original German edition is still in print.